U-10s played valiantly but lost to Naomh Eanna in football during the week. They beat Ballinastragh Gaels also in football with an excellent performance. Next game is against Craanford next wednesday evening in Craanford. U-12s lost their hurling match against a good Shamrocks team last Tuesday. This Tuesday they will hurl against Marshalstown in Ballyroebuck at 7.30pm. U-14s match was called off on Thursday. They will play Liam Mellowes in Castletown on Thursday next. U-16s lost to Duffry Rovers last Monday night at home. They are training this Monday, and although they have a bye next week there may be a game organised. Mentors will text further information. 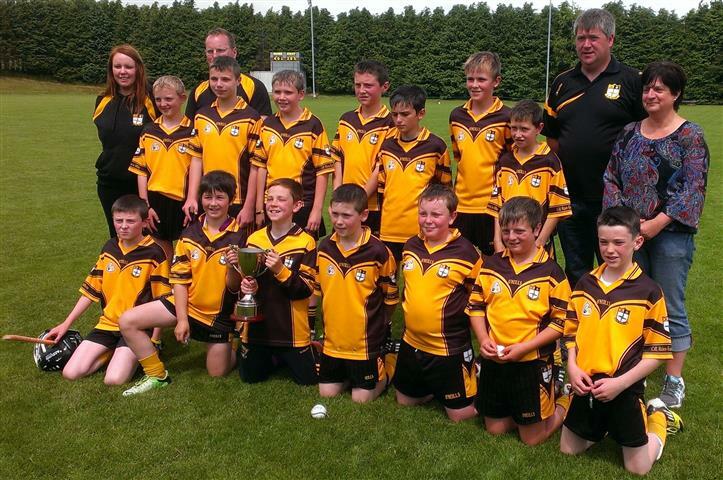 Our U-12s have been busy, they took part in a hurling tournament in Duffry Rovers on Saturday and won the shield. Well done. They play Cloughbawn in hurling in Ballyroebuck on Tuesday @ 7.30 pm. Our U-14s are playing Monageer-Boolavogue in football in Ballyroebuck on Thursday @ 7.30 pm. Our U-16s played St. Anne’s Rathangan in Rathangan and won by 2 points. Our Minors are playing Duffry Rovers in hurling on Wednesday @ 7.30 in Coolree. The quarter finals were held on Saturday 16th June. HWH Bunclody v Monageer, Marshalstown v Ballygarrett, Askamore v Naomh Pàdraig, Duffry Rovers v Buffers Alley. The Semi-finals and final will take place this Saturday 30th June in Ballyroebuck 1st match @ 12 pm. HWH Bunclody v Ballygarrett @ 12 pm, Asksmore v CLG Naomh Pàdraig @ 12.30 pm. Final @ 1.15 pm. Your support at the tournament would be greatly appreciated. Well done to all teams who took part in the quarter finals and good luck to all teams in the semi-finals and final. We would also like to thank the Kenny Family for their support.